For those who read my previous post Philips Hue Lightstrip Plus Review you are already acquainted with the Philips Hue connected lighting solution from Philips. If you haven't, I suggest to read this post as it explains the basic concept of the system and also introduces the exciting new light strip from Philips. As a recap, Hue is a solution offering retrofit lamps and luminaires which are connected to your home network and Internet. It allows users to control their lights synchronised in scenes and controlled via a smartphone or a tablet. This works thanks to the Hue bridge that is directly connected to your Internet router and communicates with the lights using a protocol called Zigbee Light Link (ZLL). You can control the lights both in and out of the home if you think you forgot to turn off your bedroom lights while rushing to work in the morning. Controlling lights with your phone via the Hue app or widgets is really fun and gives you the feeling to take a step in the future but it does not work for every occasion. Lighting is one of the most important and functional element of your home. It simply needs to work and be practical. For that reason, Philips recently introduced the Hue Dimmer Switch, a simple and affordable wireless switch that allows you to experience your Hue lights in more functional lighting scenarios. The Hue Dimmer Switch is both a wall mounted battery powered switch and a remote control as the control unit simply docks on the wall frame. Since it is battery powered it is also fully wireless. The installation is simple as you just need to tape the frame wherever it feels convenient. The product as quite a neutral design and doesn't scream "style" but it also doesn't look any worse than your average light switch. Philips chose to go with a vertical form factor which is the standard switch format in North America, against the square format you would traditionally find in Europe. Despite living in Europe and having square switches around the house I found that since it is meant to be taped anywhere you want, the shape doesn't bother me too much. What troubles me more is having several switches sitting side by side but I will come back to this point later. With 4 buttons, the switch allows for classic ON and OFF control as well as DIM UP and DOWN. Do you really need 4 buttons for this? A possibility would have been to allow a long press to dim the lights but to Philips credit not everyone would directly get this type of hidden functionalities. At least here it's obvious. Battery is a CR2450 model and is supposed to work for a minimum of 3 years so it won't be too much hassle in terms of maintenance. Currently you can only have up to 10 switches total in your system (regardless of the model you use). This limitation might be a problem for the larger homes with lots of rooms. For the average consumers though this should be enough. As the system can be upgraded over the air, we can imagine that Philips will extend the capacities of the system over time but it's not guaranteed. The product has just been released in continental Europe and North America, while it seems it will only be available in UK as of the end of November. As indicated in the previous paragraph, the Dimmer switch also comes in an attractive bundle with a single Hue White A19 lamp. What is interesting with this bundle is that it actually works as a stand alone control solution without the need to install the Hue bridge. Obviously it will lack the functionalities of the bridge like smartphone control, timers, scenes, out of home control, and plenty of other integration possibilities. You may however be attracted by this simpler offer that allows you to connect up to 10 lights (any Hue lights) on a single switch. It's a good step in for those with lower budgets and you can still down the road invest in a bridge to upgrade your installation. For the purpose of this review though, I will focus on the use of the Dimmer Switch in an actual Hue system meaning with a bridge. The installation of the Dimmer Switch is really straight forward once you figured out where you want to install it. Actually location might be your biggest challenge with this product. 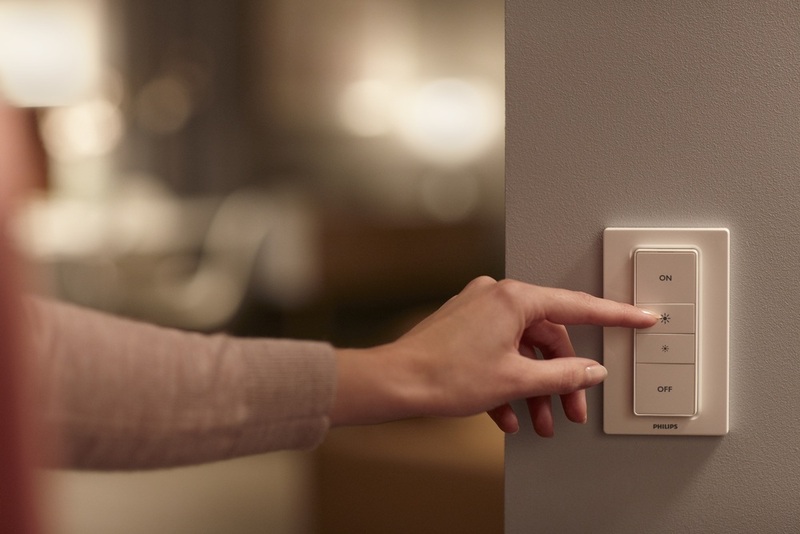 By offering a "classic" switch, Philips targets a more functional usage of their connected lights. This means that you will likely position the switch in areas that are logically next to a door or a staircase. Unfortunately, it's precisely where your legacy switches are already installed. Obviously having multiple switches side by side does not score high on design and integration and you will experience that some people will instinctively use the old switches instead of the Connected ones regardless of the benefits it brings to the light experience. Bear in mind also that connected lights always need power even when off. By interacting with the old switches, you simply disconnect the lights from the network. It's not a big problem as they will be back on with the power but it disrupts the whole concept and user experience. Considering that connected lighting is a young market, it is probably difficult for companies like Philips to bring better integration possibilities at this point. A better design could be interesting but would raise the price and probably stand out even more next to other switches. Offering different design options is probably not economically viable in terms of volumes as connected lighting is still a niche market. Obviously, the ideal scenario would be to either transform your legacy switches into smart ones using retrofit modules in the backplate or simply replace all switches into smart ones. These solutions will likely come to the market at some point but probably through professional channels as it would require electrical work anyway. If you can live with the current tradeoff, this product does offer a very interesting addition to your connected lighting installation regardless of the above comments. With the first option, your switch will control the selected lights and will power them on in whichever state they were left on, while with the second option, you will always power on the lights in the scene defined levels. You may prefer one option over the other but the good point is that you can make that choice and adjust later on if you change your mind. In my case I created for each room a specific scene with lights on at 100% with a warm white for the Hue lights and I either dim up and down with the Dimmer Switch or trigger other light scenes (with some colours for instance) with widgets on my phone. This way I combine nicely the functional and decorative light control of my rooms. To close this chapter, the reactivity of the switch is OK. Sometimes it may react a bit slower but it's never so long that you would wonder whether there is a problem. I will list few points here but you have to take into account that for the price there is not much more you could ask. Once you consider the price and tradeoffs, I believe this product really delivers on the promise. If you want to scale up your connected lighting installation with Hue White lights and combine both decorative and functional lighting, you need some physical control panels and this product does just that at a really affordable price point. While I could not see myself buying and installing the Hue Tap in every room of the house, I did get a Dimmer Switch for all of them simply because it enables a much fuller experience of your smart lights. Is it perfect? Certainly not, but it did improve my experience with the Hue system as a whole and made it much more accessible for guests and family members that don't have the Hue app on their phone. For every Hue users that want to scale up their installation with more lights, I would strongly recommend the Hue Dimmer Switch as a complementary control option. What is your experience with this product and what would be your perfect switch for Hue? Please share your thoughts in the comments below. Special thanks to Beaumotica.nl, our sponsor for this post.